Emma Welsh’s first foray into the fruit trade wasn’t a huge success. As a young girl she developed a plan to raise enough money to buy a saddle for her horse by picking strawberries. “I thought I was going to make a fortune!” she laughs. But after calculating that she had earned $1.50 for three hours’ back-breaking work, she abandoned the plan and didn’t even bother going back to collect her pay. It’s fair to say her next fruity venture has been more productive. 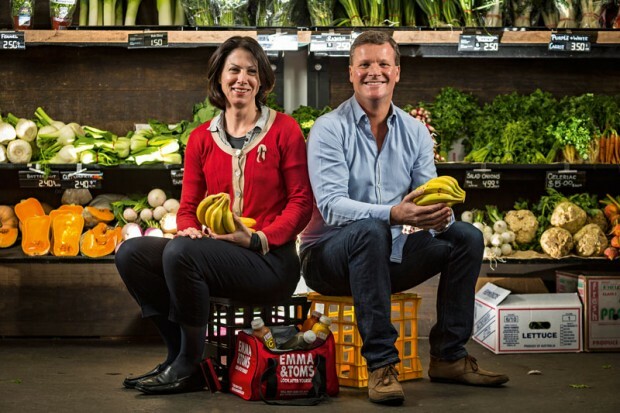 She and childhood friend Tom Griffith founded Emma & Tom’s in 2004, after Tom spotted a gap in the Australian market for additive-free bottled fruit smoothies. They’ve gone from an initial range of just four flavours – developed in Welsh’s home kitchen – to an array of drinks and snacks that’s stocked in cafes, delis and supermarkets across the country. Griffith might describe Emma & Tom’s as “the grown-up version of the kid’s lemonade stand” but it is now a serious player in the Australian market, with plans to expand overseas when the time is right. And it’s exactly the kind of business that Australia needs, with manufacturing jobs disappearing and the economy over-reliant in the eyes of some on a few big names too focused on the domestic market. The small business sector – which accounts for half of private sector employment – is under pressure too, with more firms going under than launching. But Griffith (BCom 1986, Ormond College) and Welsh (BAgrSc 1988, Trinity College) are proof that it is possible to succeed with the right product and approach. Both had successful corporate careers after graduation – Tom as a chief financial officer and adviser to the UN, and Emma as a commodities trader and marketer – and both had run start-ups in London before setting up Emma & Tom’s. That didn’t mean it was all smooth sailing. “The experience we had made us avoid some mistakes but I think it also made us make some mistakes,” says Welsh. They hired people to do jobs they should have done themselves. They were thrifty, but not thrifty enough. A decade on, they still have external advisers. Welsh says: “It’s really important to have people who can look critically at your business to help you see the wood from the trees as well as to make the most of other people’s experiences. Having learned on the job what works and what doesn’t, Griffith is an enthusiastic advocate for the new Wade Institute for Entrepreneurship at Ormond College. Established with a $10 million gift from entrepreneur and Ormond alumnus Peter Wade, it aims to give budding entrepreneurs the tools they need for success. From 2016 it will offer a Master of Entrepreneurship degree, delivered in partnership with the Faculty of Business and Economics and the Melbourne School of Engineering. The teaching will be practical, blending academic study with advice from entrepreneurs like Griffith. Students will graduate with a business plan that is hopefully strong enough to attract venture capital. Between the new Masters and the Melbourne Accelerator Program, which provides a place for entrepreneurs to grow their businesses, Black says the University can make a major contribution to creating a much-needed “entrepreneurial ecology” in Australia. “Other mid-size economies have recognised that they have got to create the next generation of globally competitive businesses that will provide the future wealth and jobs. We need to do that here. We need a new generation of entrepreneurs,” he says. That’s a view shared by alumna and entrepreneur Susan Oliver (BBldg 1973). She is the co-founder and chair of female-led angel investor network Scale. Its aim is to develop a group of savvy investors who can support early-stage ventures, particularly those led by women and mixed teams, and it’s working. Since its launch in 2013, Scale has recruited 75 members who have invested more than $3 million in six start-ups. Oliver believes a change in attitude is critical. “Everybody thought the US was on its knees post-GFC but they hoisted themselves up through their confidence and their ‘can do’ culture. Here we’re doubting Thomases and it can be a reason why our start-ups move to the US,” she says. She’d like to see Australia follow the UK’s example and allow individuals investing in start-ups to claim it as a tax deduction. “We subsidise real estate investment through our taxes. Why don’t we subsidise technology or start-up investments?” she says. She’s also wary of government policies that seek to “pick winners” in the entrepreneurial market. “I always feel really doubtful about governments that say they are going to back med-tech, or pharmaceuticals, or whatever else. What that is really saying is that they are going to institutionalise the research base and endow this group of people, whether there is something fabulous there or not. It just makes it bureaucratic and stodgy,” she says.